Musing On Beauty: Nars Summer 2012 products: a look and mini review. 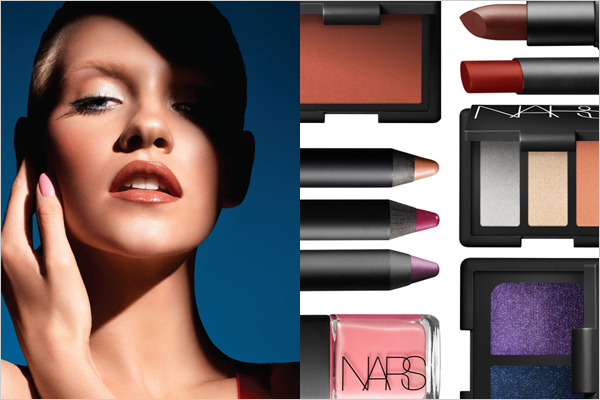 Nars Summer 2012 products: a look and mini review. While I was in London in May, I stopped by the Nars counter to get a few Summer goodies e.g the eyeshadow trio in Ramatuelle and the blush in Liberté. Bummer, Summer hasn't really arrived yet, so I haven't gotten around to wear this much so far. But we're enjoying a sunny and warmer day today, and I thought it was a good occasion! The application of the eyeshadow is pretty easy: mix the two paler colors on the lid, then add the darker peach in the crease. Higlight under the arch of the brows and on the inner corners with one of the paler colors - the peach works well for a more subtle effects but the icy blue works too, it's what I used here. How do I like the products? I think that the eyeshadows, although they're not overly pigmented, are really pretty and combine greatly to create a summery but very wearable look. You can add some liner for a bit of drama. The texture is easy to blend, not overly frosty or shimmery, and I think this is pretty foolproof to use. Also, the combination of colors works particularly well for blue or grey eyes. The blush, on the other hand, is trickier to use. It is very dark and more terracotta-ish than peach. On the promo picture, the blush is actually used like a bronzer to contour but on me this just looks ridiculous (yes, I tried, of course!). I need to apply it with a very light hand and a skunk blush, but even this way I don't find the texture to be the easiest to work with. I'm not really conviced by this one. I think that the darker peach shade of the eyeshadow trio would actually make a pretty blush with this look!